The Brushy Basin Member of the Morrison Formation consists mostly of a mudstone and claystone lithology composed to varying degrees of smectitic clays (Turner and Fishman, 1991). We propose this unit as the regional seal for the sand-dominated units that compose the brine formation selected for consideration of CO2 sequestration. We found an isopach map for the Brushy Basin Member only in a small area of the Grants uranium district, but Turner and Fishman (1991) did provide a map of the different clay mineralogies of the unit. By extrapolation, we present this map as a first-order approximation of the continuity of the Brushy Basin Member. Turner and others (1991) also presented a cross section (their fig. 1, A–A') that contains measured sections at Beclabito (west of Shiprock, NM) and Piedra River (east of Durango, CO). 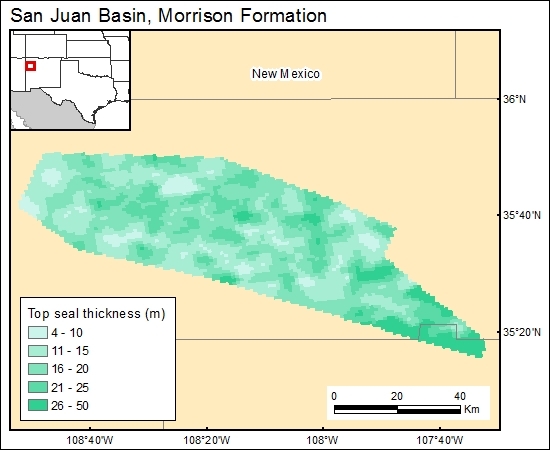 The sections contain more than 50 and 90 m (gross), respectively, of the Brushy Basin Member. The Piedra River section contains at least 40 m of authigenic albite tuffs. Presumably these tuffaceous and altered tuffaceous deposits thin southwestward toward the Beclabito section, where tuffaceous material composes much less (<20 percent) of the section (fig. 4, Turner and others, 1991). We assume that the claystone and tuffaceous lithologies constitute the aquitard that confines the underlying aquifer. Kirk, A. R., and Condon, S. M., 1986, Structural control of sedimentation patterns and the distribution of uranium deposits in the Westwater Canyon Member of the Morrison Formation, northwestern New Mexico—a subsurface study, in Turner-Peterson, C. E., Santos, E. S., and Fishman, N. S., eds., A basin analysis case study: the Morrison Formation Grants uranium region New Mexico: American Association of Petroleum Geologists Studies in Geology No. 22, p. 105–143. Freethey, G. W., 1987a, Upper Colorado River Basin regional aquifer-systems analysis—Mesozoic rocks in Colorado, Utah and Wyoming, Arizona, and New Mexico, in McLean, J. S., and Johnson, A. I., eds., Regional aquifer systems of the United States—aquifers of the western mountain area: 23rd Annual American Water Resources Association (AWRA) Conference and Symposium, Salt Lake City: AWRA Monograph Series No. 14, p. 57–70. Turner, C. E., and Fishman, N. S., 1991, Jurassic Lake T'oo'dichi': a large alkaline, saline lake, Morrison Formation, eastern Colorado Plateau: Geological Society of America Bulletin, v. 103, no. 4, p. 538–558.